A new and much awaited launch for Mochi Craft, who just put in the water the latest of the planing line, the 64 Dolphin Cruiser. In the last days of July, the technical launching operations for this new Mochi have been carried out at the dock of Cesenatico Italy. This new model is the tryed and tested result and collaboration between the famous architect Brunello Acampora from Studio Victory Design one of today's best hull designers, and Norberto Ferretti Advanced Yacht Technology and the Centro Stile Ferrettigroup, and is a further development of the 64 Dolphin. This team has designed all the Mochi Dolphin down East lobster inspired cruisers and yachts. After all technical operations are completed, the second Dolphin Cruiser will move to France, where it will be presented as a world premiere at the 35th edition of the Cannes show, from 11th to 16th September, and after this going to one of the largest boat shows in Genoa Italy at the start of October. 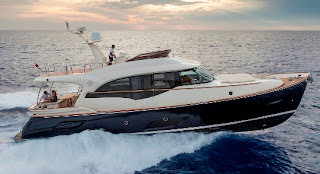 As expected with a hull having the signature of Victory design sailing excellence is a big part of this new model, mixed up with comfort and a further touch of Italian innovation are key-words of this new 64 Dolphin Cruiser. A painstaking care for on board finishing is the characteristic of the brand: from deck gunwales to lifelines in solid teak with a natural finishing, to the master craftsmanship featured in the cleats obtained from one single block of steel, bearing the engraving of the dolphin. Wide glazing of the 64 Dolphin Cruiser offers extended views of the sea, and the external light enhances the volumes on board. Light is the protagonist underdeck as well, thanks to the typical glazing on the hull. The distinguishing feature of the external layout is the wide flybridge, extending towards the stern, covering the cockpit which is a major difference in this new Cruiser series as shown in the previously launched 74. Inside the 64 Dolphin Cruiser presents three double cabins, with a full beam owners room to midships. Another nice very Italian yacht feature of the 64 Dolphin Cruiser is the seperate galley to starboard on the main deck, with an eight persons dining table opposite to port side. Power is from twin MAN 1100 or 1224hp engines which give max speeds up to 31 knots with the large choice.